I figured that since I needed to catch up on a ton of mail, I would post twice today. So, I added 3 more 1971 Topps cards off of my wishlist with my most recent COMC purchase. I got this 1971 Topps Bobby Bonds and also Fergie Jenkins and Tony Oliva. I think the biggest name I need, still, is Harmon Killebrew. My 1971 set is so close to completion. I really would like to get this one knocked out so I can concentrate on 1959 and 1969. When those two are completed, I will likely knock out 1972 and maybe another set from the 1960s. We'll see, that's a long way off. Chris Davis is having quite a season for himself. After last night's 2-home run game (his third of the season), Davis has reached 30 home runs before the All Star break. 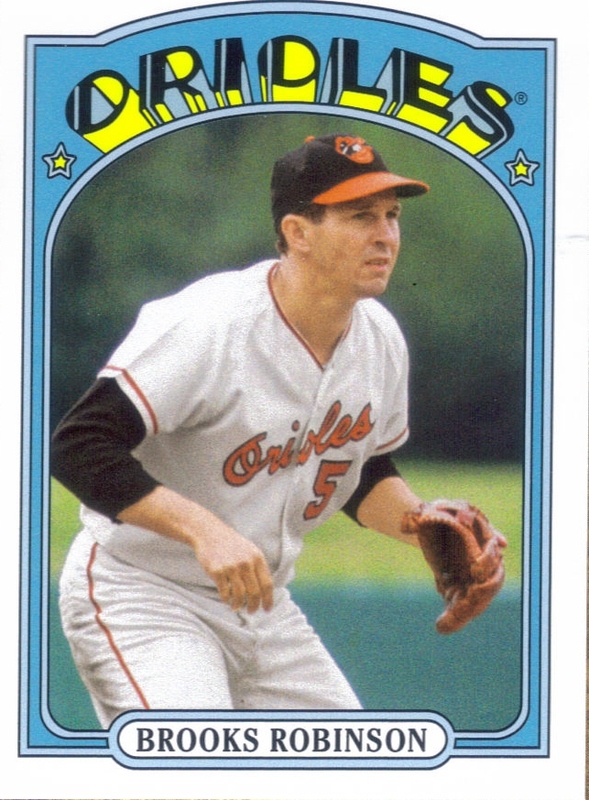 He tied the Orioles record, with Brady Anderson's 1996 performance, for most home runs before the All Star break. 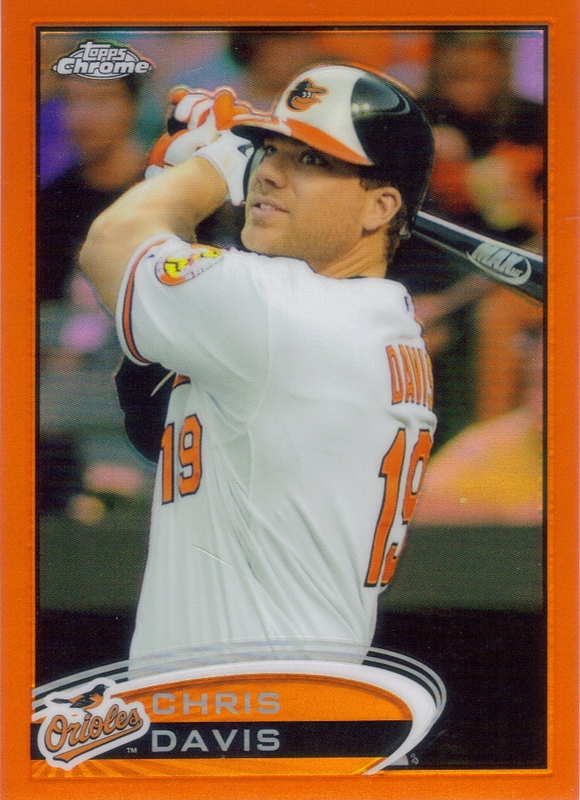 I have been gathering as many Chris Davis parallels as I can since I'm sure there will be a spike in the cost of his cards soon. I got 3 new cards off of COMC with my latest purchase, two parallels from 2012 Chrome and the 2013 Topps blue sparkle. 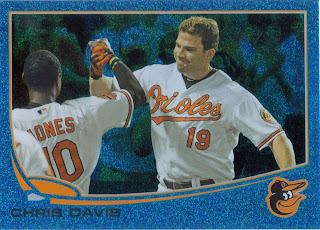 I think the Orange parallel looks really cool scanned, especially since the orange matches up well with the Orioles' uniforms. The purple parallels are really cool as well, of course. I also have his black parallel and X-Fractor, so I am doing pretty well with his 2012 Chrome offerings. 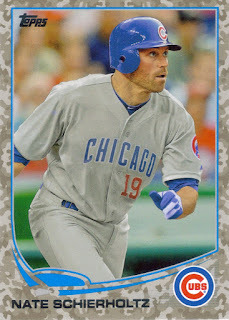 If anyone has any 2012 Chrome parallels that I'm missing, please let me know. 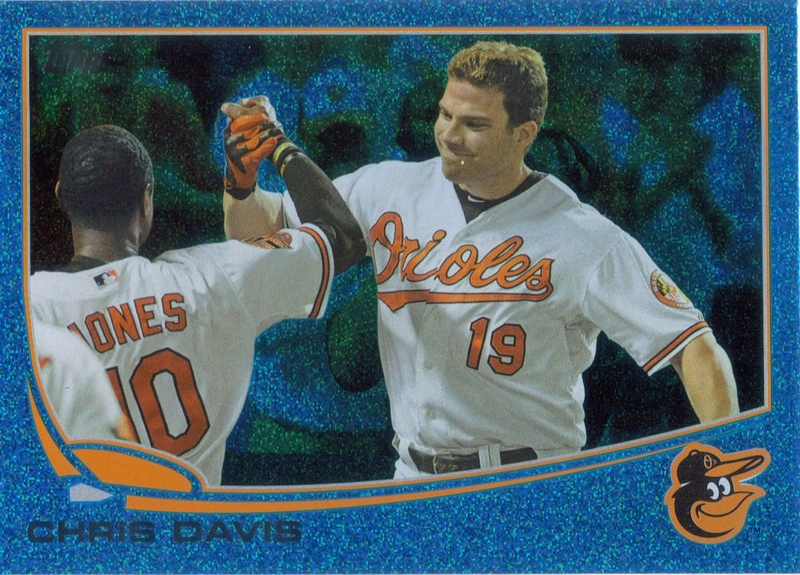 Finally, here is the 2013 Topps blue sparkle parallel. I also have his Silver Slate, but I need to add his Emerald (I have one for my set), the black parallel, gold parallel, etc. 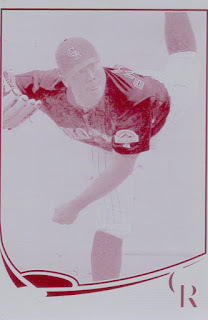 I also wouldn't mind a printing plate. Not to mention Pink and Camo parallels too. Yikes, there are too many parallel cards to chase, it makes my head hurt. 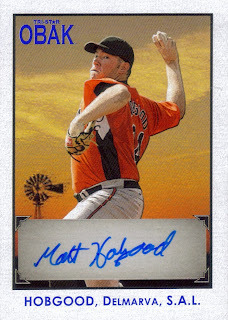 I took another item off of my wishlist with my recent COMC purchase in the above 2010 Obak Matt Hobgood auto. 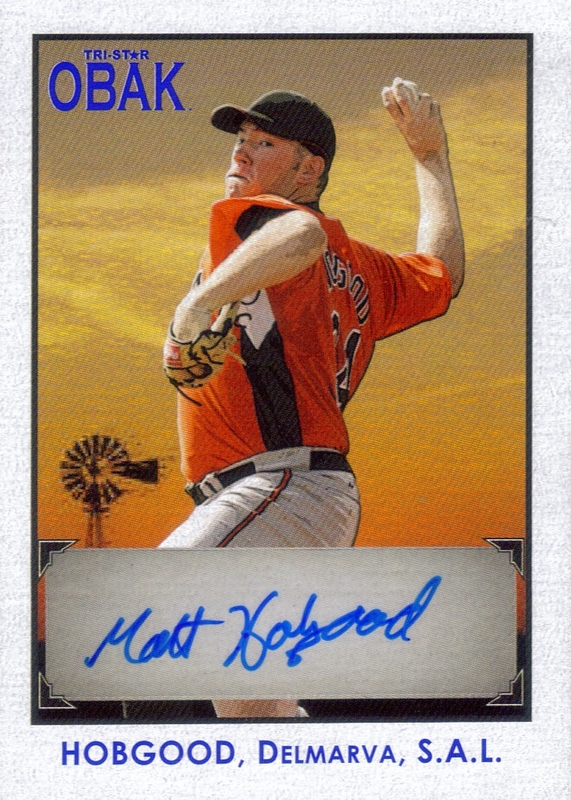 I met Matt Hobgood back in 2010 when he was playing for Delmarva against the Greensboro Grasshoppers in Greensboro. I tried to get his autograph after the players were coming off of the field, but I just missed Hobgood. I left the stadium and noticed the team bus and tried to hang out there at the sidewalk. Steven Bumbry, son of Oriole great, Al, was nice enough to remember that I had been trying to get Hobgood's autograph on a baseball, went on the bus and told Hobgood that I was trying to meet him. Well, Matt came off of the bus and talked to me for a minute and signed my baseball for me. He was only 18 or 19 at the time, but had the professionalism of a seasoned vet. He is a really nice guy and I have prayed so hard that he have a successful MLB career. He has struggled with a shoulder injury since he was drafted, but this season he appears to be healthy and is pitching well out of the bullpen for Delmarva. I really hope he gets a promotion to Frederick so I can see him pitch against the Carolina Mudcats and maybe say hello again. If I ever do another blog interview, he is definitely on my short list of potential subjects that I would like to interview. I knocked a nice card off of my want list the other day when I made a purchase with my store credit on COMC. I had sold a few cards on there and built my store credit up to $54, so I bought quite a few cards. 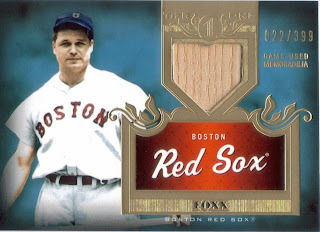 I got this 2011 Topps Tier One bat relic of Hall of Famer, Jimmie Foxx for about $15. Foxx is probably one of my favorite Hall of Famers, so I have been wanting this card since Tier One came out. The bat relic card is numbered 22/399. Tier One did a really good job of having relic cards of higher-end Hall of Famers at decent prices. I mean, I was able to get a Foxx bat relic for only $15. There are other offerings with Foxx relics that are far mroe expensive. 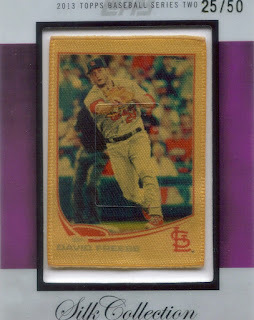 My good buddy, Drew, was able to put together the entire 2011 Tier One relic set, which is an amazing feat in itself. There are a few more that I wouldn't mind getting, but I don't think I will be pursuing the entire set. 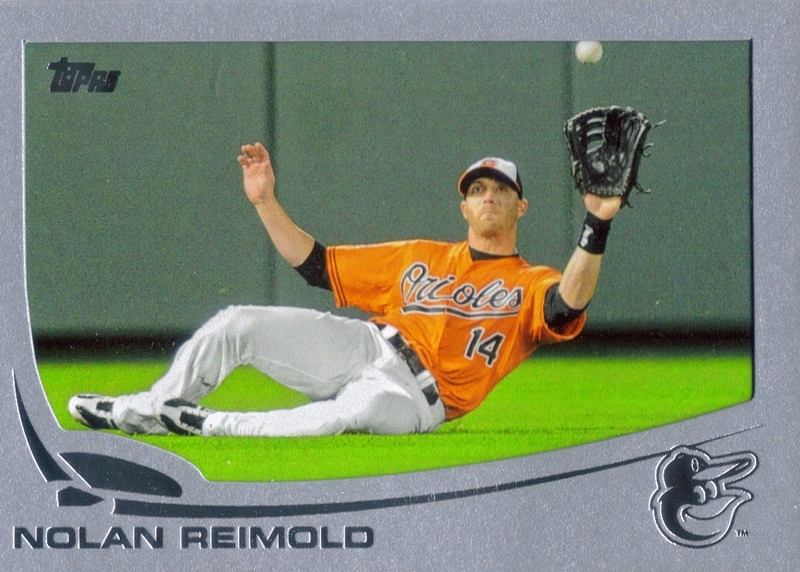 I added a nice piece to my Nolan Reimold PC today when the Silver Slate parallel came in the mail. The card is numbered 3/10 and looks really awesome. I enjoyed the Silver Slate parallels this year, even though the ones from Series One were from the wrapper redemptions and apparently Series Two's came from promo packs at card shops. Grrr. Oh well, they were available on Ebay, so I was able to get mine pretty quick. It did cost me $23 to get it, but as huge a Reimold fan as I am, I had to have it. I wanted to do more with my cards tonight, but I'm exhausted from work, so anyone who is expecting a package from me soon, I will pack them tomorrow and get them in the mail Friday. After sorting through all of my 2013 Topps Series 2 cards, I wanted to show a few of the inserts I picked up. I busted 3 jumbo boxes of Series 2 and ended up with 30 1972 Minis. 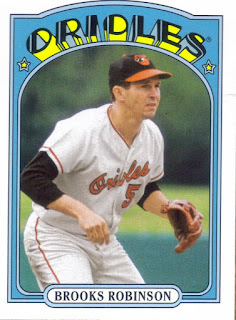 You can see I got the above Brooks Robinson for my PC. I also got Bundy, Machado and Lincecum that I will be holding onto. For trade I have: 51, 53, 54, 55, 62 (x2), 66, 69 (x2), 70, 72, 74, 76 (x2), 80, 81, 83, 87, 88, 89 (x2), 92, 93, 94 (x2) and 99. Here is the one Camo card I picked up. 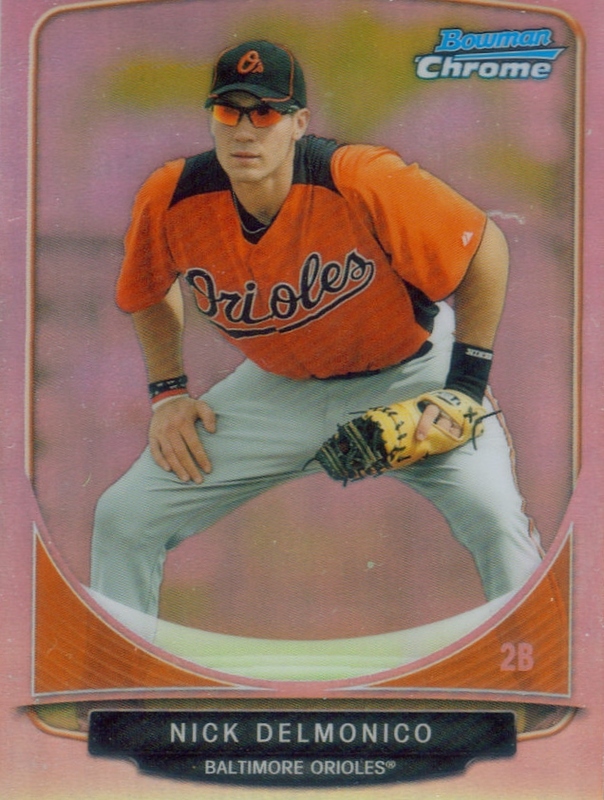 I didn't pull any pink parallels. I have already had someone ask for any Camos that I pull, so this one is likely not for trade. 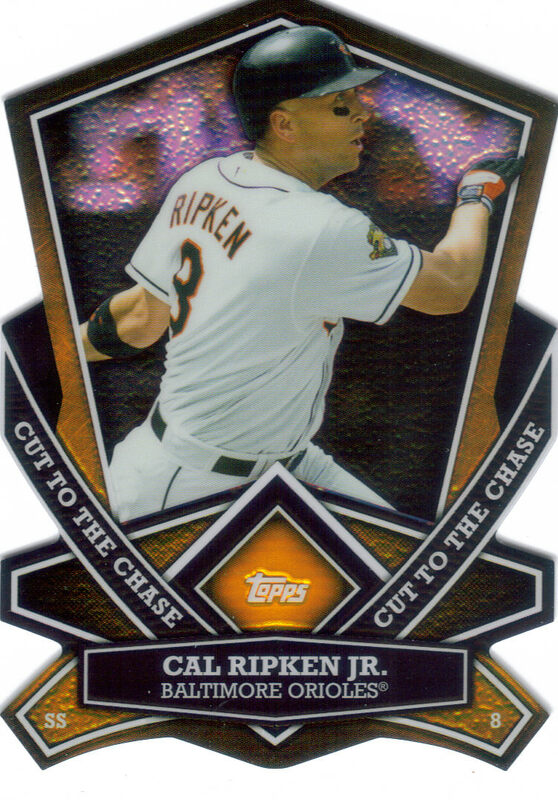 I got a Cal Ripken Cut to The Chase as well as a Manny Machado. Other guys I got, who are for trade are as follows: Killebrew, Miguel Cabrera, Albert Belle, Banks, Jered Weaver, Posey and Koufax. I ended up with two case hits in my boxes, which was really cool. This Jorge De La Rosa may be for trade if someone has something comparable to it. I got 30 Topps Gold parallels. One of which is the above Brian Roberts for my PC. I was really happy that Roberts, Markakis and Reimold are all in this series, so I have some parallels to chase down. Other golds I got for trade are: 333, 370, 377, 389, 407, 429, 430, 459, 467, 471, 477, 482,504, 519, 530, 562, 576, 584, 593, 608, 619, 620, 622, 624, 626, 633, 655, 658 and 659. My manu-relics consisted of Willie McCovey ROY, Ted Williams 1946 MVP and Luis Aparicio ROY. My relics were the above Jeter (not for trade), Tim Lincecum (not for trade) and Carl Crawford. The autos I received were Wilin Rosario, Collin Cowgill and Chris Archer. The Making Their Mark cards look really sharp. I got the above manny Machado for my PC, plus another that will likely go to Ryan. I got 28 others and they are for trade as follows: 1, 2 (x3), 3, 5 (x2), 6 (x2), 8 (x2), 9, 10 (x2), 11 (x3), 13 (x2), 15 (x3), 16, 21, 22 (x2) and 25 (x2). Another of the case hits was this #25 of 50 (OH DEAR LORD EBAY ONE OF ONE!!!!) silk parallel David Freese. This one has been claimed and a trade is in the works. I got 15 WBC cards, all for trade. 3, 4 (x2), 5 (x2), 6 (x2), 8, 10, 12, 13 (x2), 14 (x2) and 15 (x2). I got 2 Topps Black parallels, Jon Lester #12 of 62 and Devin Mesoraco #35 of 62. I got 7 'The Elite' cards. They look really sharp, like Museum Collection or something and are pretty thick. For trade are: Willie Mays, Ted Williams, Bob Gibson, Sandy Koufax, Johnny Bench, Jackie Robinson and Ozzie Smith. I got 15 'Chase it Down' inserts including Manny Machado (he is all over this set) and Adam Jones for my PCs. Weston from Fantastic Catch is getting most of these with the exception of the Pablo Sandoval, which is going to my nephew, Jacob. Remaining cards for trade are: Bryce Harper, Cameron Maybin, Mike Trout, Alex Gordon and Mike Moustakas. 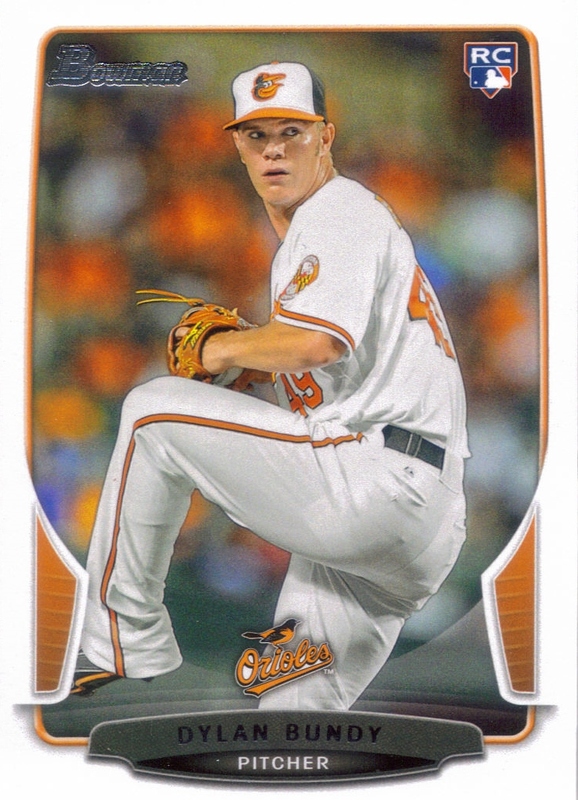 Chasing History inserts included Manny Machado (again) and Dylan Bundy, so those are mine. Cards up for trade are as follows: 51 (x2), 52 (x2), 54, 56, 59, 66 (x2), 69, 70, 72, 73, 74 (x2), 75, 76, 81, 82, 83, 88, 89, 92, 95 (x3), 98 and 99. I hope everyone remembers that I am pursuing the Emerald parallel set. I am about a third of the way done with Series One and now need a bunch for Series 2. I got 30 parallels out of my boxes. Here are the cards that I got, meaning, I don't need to trade for these: 336, 337, 338, 363, 373, 374, 382, 389, 393, 411, 418, 433, 439, 455, 458, 464, 469, 474, 480, 529, 537, 550, 553, 557, 564, 565, 589, 590, 625 and 661. Last, but not least, I pulled an SP. 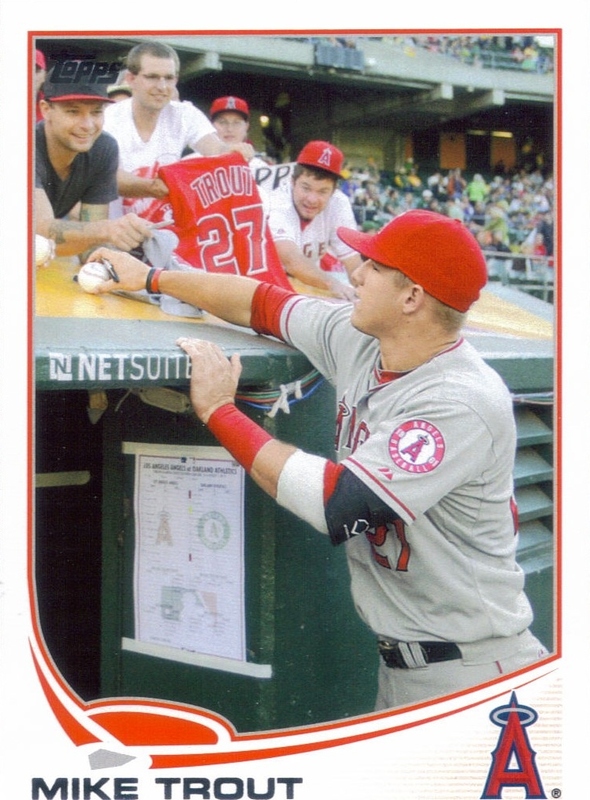 I got the Mike Trout signing autographs SP, which is a really cool card. I have also seen the David Ortiz Boston Strong speech card, which is just amazing. This Trout might be for trade, but it will take something really good to land it. Do you have what it takes? So, there you have it. Several of the teams have been called for out of the inserts, so I will be going back through them either tonight or tomorrow. Once I do so, I will transfer my 'haves' over to my trade page (which needs some life, for sure). I also plan on going through my inserts from Series One and adding them to the trade page as well. I'm either going to trade most of this stuff away, listing some on COMC or setting up a table at my local card show very soon. These boxes were expensive and I plan on making back a little bit of what I spent and I think I can do so pretty well. That being said, if there is anything any of you want, please don't hesitate to contact me, either by email or commenting on the blog. I appreciate all of the folks who have already gotten with me and the others who plan to. 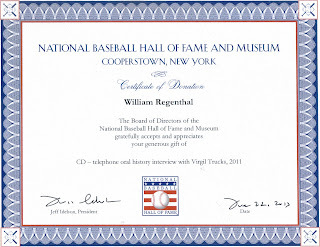 My Hall of Fame donation certificate finally arrived today and man, it looks awesome! 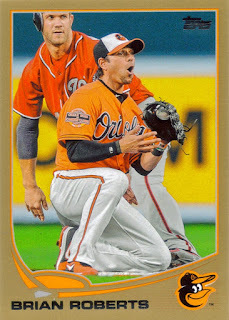 I was all set to blog about some 2013 Topps Series 2 inserts and this was laying on my desk. I can't begin to tell you how excited I am to have this. I am going to run out and pick up a frame as soon as possible and put this on the wall for all to see. 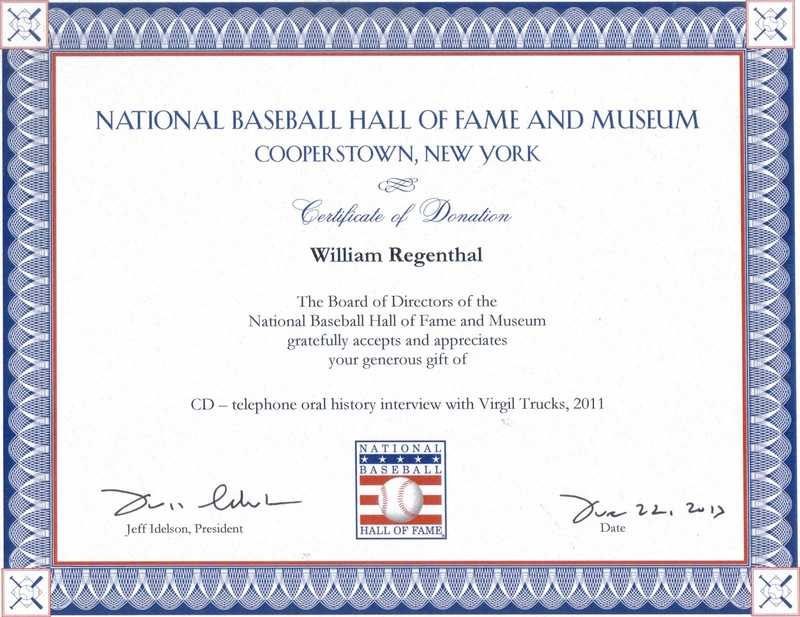 I am really excited that the Hall of Fame added my interview with Virgil Trucks into their library and I hope that generations to come are able to hear his story and learn a little bit about the man that meant a lot to me and other fans out there. I'm also glad I was able to share this experience with all of you. Thanks for reading this blog and commenting. I hope that I am able to do something like this again very soon. Here is my completer card for 2013 Topps. 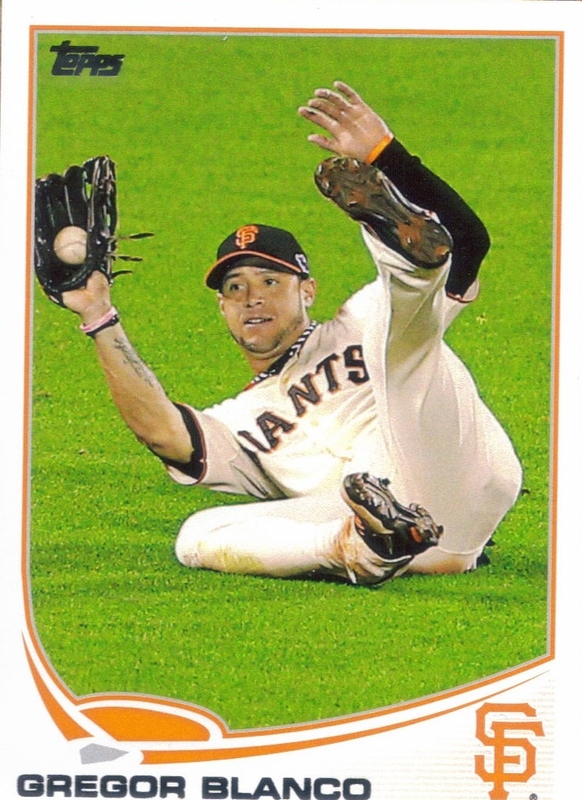 Gregor Blanco is allowed to grace my blog because his card was the last one to fill in any gaps in my 2013 Topps set. Now that I have the sorting and collating out of the way (I ended up with 2 sets, by the way), I can now break down the remainder of the cards I have and begin some trading. I will also be doing some scanning of some cards that I thought were amazing shots in this set, as well as doing a breakdown of the inserts I got from my boxes. This definitely was a nice way to spend a rainy Sunday. 2013 Topps Series 2 - Let The Sorting Begin! Did I forget to mention that I got my 3 Jumbo Boxes in the mail yesterday from Crane's Cards out of Winston-Salem? Oops. I was pretty excited. I did the box busting over Skype with my good buddy, Andrew from Andrew's Cards. I think this is the third time I have shared my box break with him. 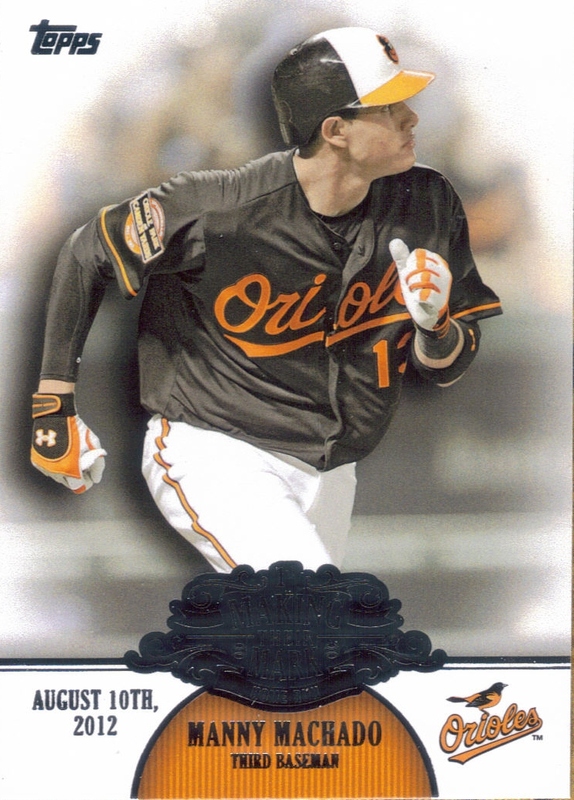 I just have to say that Series 2 has a ton of awesome photos and LOTS of Orioles in the base set and in a lot of the inserts. Two of my favorite Orioles, Brian Roberts and Nolan Reimold are featured in Series 2, so I will have some rainbows to pursue. Here is a look at the sorted results of the break, by type of card. I ended up with two 'case' hits that I will discuss later. I also got one short print that will be featured in an upcoming blog entry. For now, I will take my leave so I can begin sorting the base cards and putting my set together. Just to let you all know, I am taking requests for trades. Andrew has requested most of the Cardinals, followed by Weston asking for other Cardinals and any extra RCs that I may have. Drew gets most of the Yankees. I am still looking for Emeralds from Series One and am definitely going after the set for Series 2. Shoot me an email! I'll have more details of pulls and what all is available soon. I went to the card shop recently and noticed some new stuff on the shelves in the form of 2013 Panini Team USA. I bought something like 6 packs of them figuring that one of my good friends who loves Team USA would like them, even if I didn't. 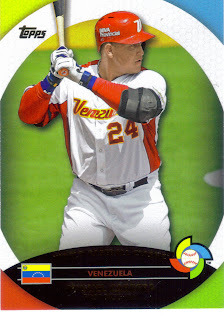 Well, I was very pleased with Panini's offering this year (which seems to have become the norm). They put in a good mix of past Team USA players in with some of today's prospects. 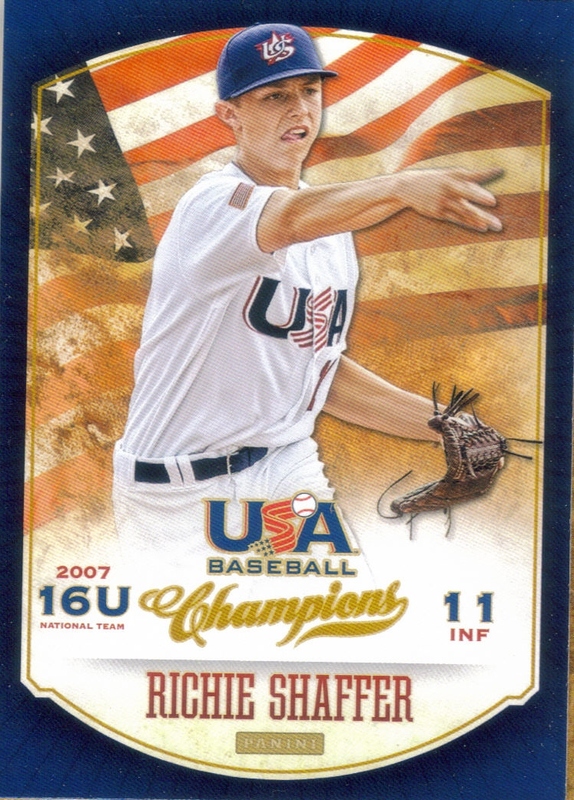 The above card of Richie Shaffer is significant because my good friend Corbin went to high school with Shaffer. He is from Charlotte, NC and played at Clemson. He was a first round pick (25th overall) by the Tampa Bay Rays in 2012 and is playing for the High A Port Charlotte Stone Crabs. I definitely will be picking up some more Team USA packs. I might go for the set at some point, we'll see. I might trade some of the cards I pulled. There was a Barry Larkin in there that might be sent away. Some other veterans as well. I got a decent-sized package in the mail recently from my buddy, Andrew. In the package was a ton of Orioles cards from recent releases such as 2013 Bowman, 2013 Topps, 2012 Topps, etc etc. A lot of them I already had, but Andrew made sure to mention that I should give a few of them to my son, Chris, which I will. There were a few cards in the package that I didn't yet have in my Orioles PCs, like the above Nicky Delmonico chrome mini or the below Dylan Bundy Bowman base card. I have actually pulled only one Oriole out of the several packs of 2013 Bowman, a Jim Johnson base card. I wonder why it is so tough to pull any Orioles out of there... Geez. Anyway, thanks so much for the cards, Andrew. I'm sure I will be able to get you some Cardinals pretty soon. I finally added a new card to my Virgil Trucks collection recently with this ebay pick up. 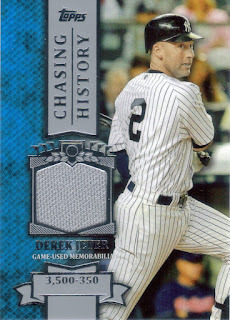 It is a 2003 Upper Deck Yankees Signature Series. The autograph is on card, if that's something you focus on. It does make the card look really sharp, even though pinstripes make me nauseous. I really like it and was able to land it for $9. I have seen them go for $20 most times, so I had to jump on this deal. Also, I apologize for not posting for a few days. I went out of town to hang with the in-laws for Father's Day. I left the laptop at home, which is a rarity, but it was really nice to be without it. I did have my smart phone, so I was keeping up with the Orioles games, but I still haven't mastered writing full sentences with the tough screen. One day, I'll be adept at blogging with my phone. I went to visit my parents' recently and spent a little bit of time across the street at my brother's house showing him how to work Ebay and how to look up my blog. I hope the lesson stuck. 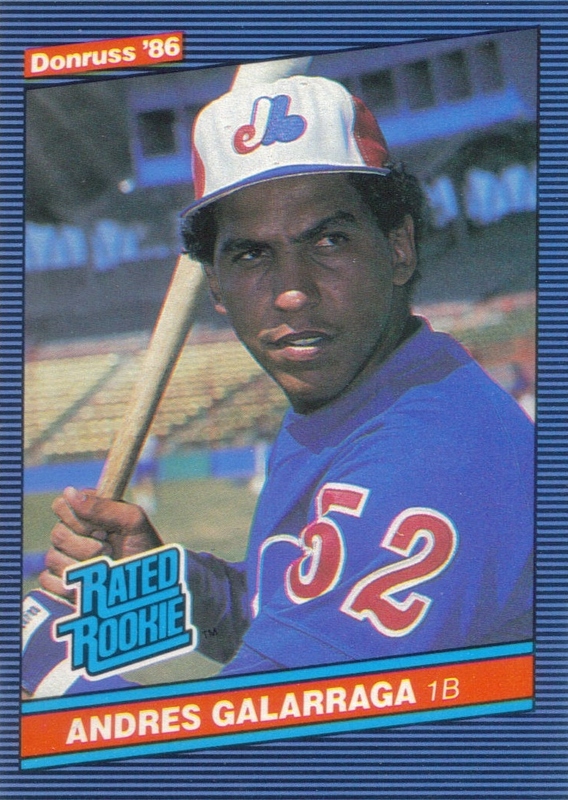 Anyway, on my way out the door, John gave me the above 1986 Donruss Andres Galarraga RC. I have always liked the design of 1986 Donruss. I actually own the 1986 Donruss Highlights set, but that is a copper colored set as opposed to the blue you see above. This card is in great shape, as my brother is a real stickler for condition. He had 2 of the Galarragas, so he was ok with parting with this one. Galarraga (b. 1961) played in the majors from 1985 to 1998 and 2000 to 2004 for the Expos, Cardinals, Rockies, Braves, Rangers, Giants and Angels. He missed the 1999 season while he battled cancer. In his career, he had 2,333 hits, 399 home runs and a .288 lifetime batting average. He was the 1993 NL batting champion when he hit .370 for the Rockies. He was an All Star 5 times in his career and won 2 Gold Glove and one Silver Slugger awards. He appeared on the 2004 Hall of Fame ballot but got only 4.1% of the vote. I don't think he ever gets in, but he was still a heck of a player. I definitely have to thank my brother for this RC of The Big Cat. 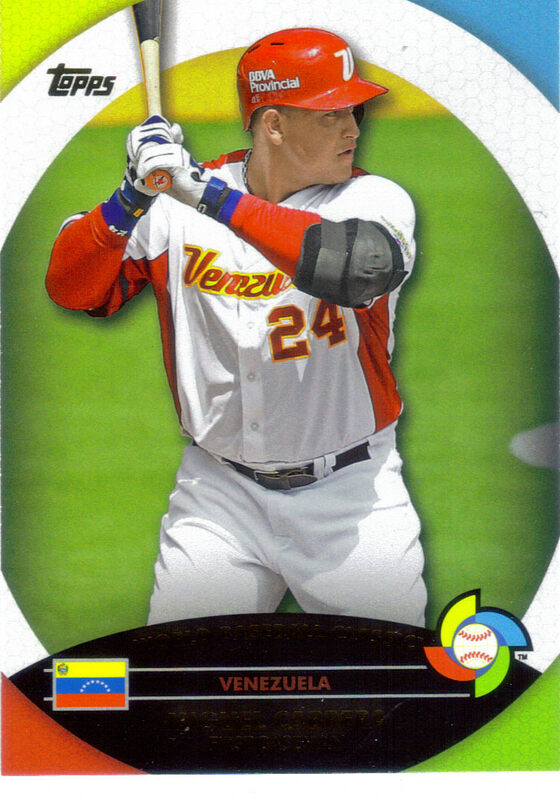 I always liked Galarraga. He won a lot of Sega baseball games for me. I played a season on one of the games as the Rockies and I think he hit over 100 home runs for me. 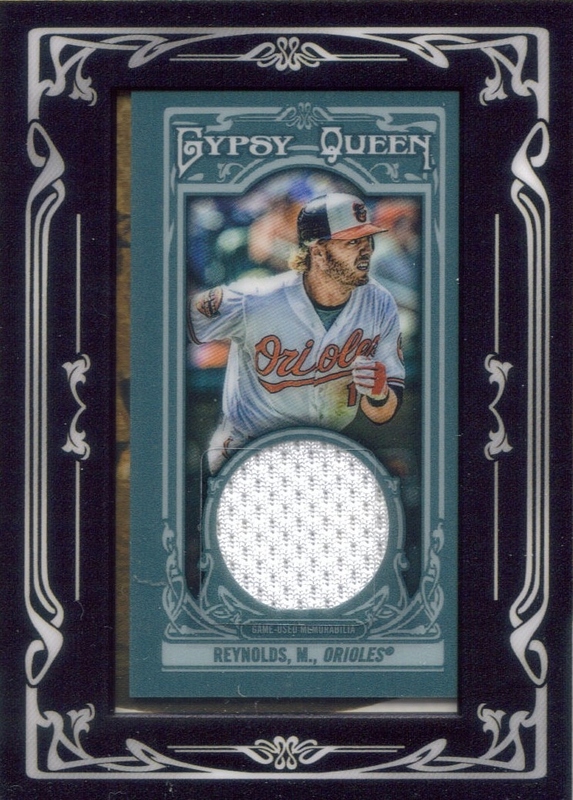 I got a nice package in the mail the other day from fellow blogger, Judson (read his blog, HERE), which contained the above Mark Reynolds 2013 Gypsy Queen relic card. Judson knows how big an Oriole fan I am and even though Reynolds isn't with the team anymore, I am still happy to add this Reynolds to my collection. I really need to come up with some nice Rangers to send Judson's way to pay him back for his generosity. I might have to dig through some boxes to find something good, but it can be done! I feel kind of weird not posting a picture of a ball today. Considering that my last few weeks of posts have been about signed baseballs. I guess I'll just need to buy another! I received this TTM success last Saturday, June 1, 2013 after completely forgetting that I had even sent it. I mailed to George Yankowski on April 4, 2013, making him an almost 2-month TAT. I got the ball signed with no fee. George Yankowski (b. 1922) played in the majors as a catcher in 1942 and 1949 for the Philadelphia A's ('42) and the White Sox ('49). He had 5 hits, no homers and a ..161 batting average in his 31 plate appearances in his career. Did you interact with Eric McNair much/at all in your brief time with the A's in 1942? Eric was a fine man & good ball player and older than I was - the younger players usually hung out together. What do you remember most about playing for Connie Mack? Mr. Mack was very patient with the younger players. Did you keep any mementos from your playing days? Do you still watch/follow baseball today? If so, which team? So, I was really happy to get this, my 74th TTM success. This is the only signature on the baseball that I am not sure of. Jackie Hayes (b. 1906 - d. 1983) played in the majors from 1927 to 1940 for the Senators (1927 to 1931) and White Sox (1932 to 1940). He had 1,069 hits, 20 home runs and a .265 batting average in his career. 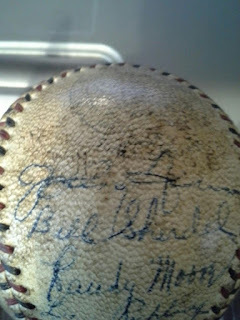 The signature is on the top of the side panel, above Bill Sherdel. Something that doesn't make sense is that this signature is with all Boston Braves players, so it would make sense if it was a Braves guy, but I couldn't find anyone who matched up with the signature. I looked at comparable signatures of Hayes and it doesn't quite fit. Kind of like when you are putting a puzzle together, you think you have the right piece, but you have to use a hammer to get it where you think it should go. Here is a look at the signature, a bit closer than the other pic and I still can't really tell with great certainty if it is or is not Hayes' signature. I guess I will call it his until proven otherwise. This is the last signature on the ball. I figured out that it was signed between 1930 and 1931 by players form both the Boston Braves and Washington Senators. I don't know if it was signed at a Spring Training game (since the Braves were NL and the Senators were AL and there was no Interleague play those years and those teams didn't meet in the World Series. The only Hall of Famer on the ball that I know of is Joe Cronin and his signature doesn't completely match his later offerings, but it is reasonable to assume that his signature could have evolved over time and you also have to account for any fading that could have occurred in the 80+ years since the ball was signed. The ball came with an auction LOA fro JSA Authentication, and the Cronin signature was listed as authentic, so I don't doubt it. I can take this ball now and have JSA certify the rest of the signatures as well as try to confirm with them the Hayes signature. I feel that if I did this, and after doing all of the leg work identifying the other guys on the ball, I have increased the value of the ball substantially. I had a lot of fun figuring out who all was on the ball and learning about players from that time. There were a ton of Hall of Famers who COULD have been on the ball, but it was kind of nice to take a look at some of the other guys who played then. I hope you all enjoyed this series as much as I did. I hope it wasn't as boring as it could have been. I'm getting down to the final names on the baseball. This one, of Wes Schulmerich, is the second signature on the Sweet Spot of the baseball. Schulmerich (b. 1901 - d. 1985) played in the majors from 1931 to 1934 for the Boston Braves (1931 to 1933), Phillies (1933 and 1934) and Reds (1934). 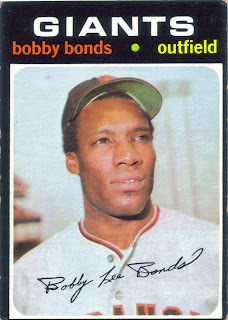 In his career, he had 417 hits, 27 home runs and a lifetime .289 batting average. He was originally signed by the Cubs and was traded to the Boston Braves on October 14, 1930. That takes him out of possibly being with the team for Spring Training of 1930. I had originally thought, since Ed Gharrity last played in 1930, that all of the players could have been gotten at one Spring Training game. It is still possible that Gharrity was with the Senators for the Spring of 1930 as a coach or something, so my guess would still be that this ball was signed in 1931 during Spring Training. Another possibility is that whomever got the ball signed went to two games and got signatures both times. It is definitely a mystery, still, for sure. I can safely narrow it down to sometime between 1930 and 1931, though and that is really cool. I meant to post this yesterday, but I got home from work late and ended up watching MLB Network's coverage of the draft in its entirety. Fred Maguire's signature is seen here on the Sweet Spot of my signed baseball. Maguire (b. 1899 - d. 1961) played in the majors from 1922-23 and 1928-31 for the Giants (1922, 1923), Cubs (1928) and Braves (1929-1931). He had 545 hits, 1 home run and a .257 batting average in his brief career. In 1928, he was traded from the Cubs, along with Bruce Cunningham, Percy Jones, Lou Leggett, Socks Seibold and $200,000, to the Braves for Hall of Famer Rogers Hornsby. Maguire played on the 1923 NL Champion Giants that lost to the Yankees in six games. He matches up with the other Boston Braves on the ball from 1930 and 1931. The next player on my 1930s signed baseball is another Washington Senator, Ed 'Patsy' Gharrity. Gharrity (b. 1892 - d. 1966) played in the majors from 1916-1923 and 1929-1930, all for the Senators. He was a coach for then manager, Walter Johnson, in 1929 and 1930 and again later from 1933 to 1935 while Johnson managed the Indians. In his career, Gharrity had 513 hits, 20 home runs and a .262 batting average. As far as I can tell, Gharrity now becomes the oldest player (born in 1892) that I have an autograph of on a ball, as well as the person who played the longest ago, his career beginning in 1916). As far as the baseball goes, Gharrity only matches up well with the other Senators I have featured for the 1930 season. That places the time the ball was signed maybe late 1930 or possibly early 1931, if Gharrity happened to be with the Senators for Spring Training in 1931. Taking a look at the 1916 Senators on which Gharrity debuted, the team finished the season 76-77 (7th in the AL). The team was managed by Hall of Famer Clark Griffith and featured two other Hall of Famers, Walter Johnson and Sam Rice. The team's hits leader was Clyde Milan (154); batting average was Milan again (.273); RBIs was Howie Shanks (48) and the Home Runs leader was Elmer Smith with 2. On the pitching side, Walter Johnson led the way with 25 wins (and also led with 20 losses), ERA with 1.90 (WOW!!!) and 228 strikeouts. Imagine if Johnson had gotten more run support that year, he would have probably won 40 games. Ossie Bluege (b. 1900 - d. 1985) played in the majors from 1922 to 1939, all for the Washington Senators. He had 1,751 hits, 43 home runs and a .272 career batting average. Bluege was an All Star in 1935 and finished as high at 10th in the AL MVP voting in 1925. He was a member of the 1924 World Series Champion Senators and was also a member of two other Senators teams that reached the World Series (1925 and 1933). Bluege went on to manage the Senators from 1943 to 1947, finishing as high as 2nd in the AL in both 1943 and 1945. Bluege was named the Senators Farm Director in 1948, serving in that position until sometime before 1958. During his time as Senators Farm Director, he was resposible for scouting and signing Hall of Famer Harmon Killebrew. Bluege would serve in some capacity with the Senators and later the Twins (after the Senators relocated to Minnesota in 1961) for 50 years, retiring in 1971. Bluege appeared on the Hall of Fame Ballot 6 times (1948, 1949, 1954, 1956, 1958 and 1960) but never garnered more than 1.7% of the vote. Bluege obviously ties in well with all of the other Senators on the baseball, having spent his entire career there. Interestingly, he was also teammates with several Hall of Famers over his career: Walter Johnson, Bucky Harris, Goose Goslin, Sam Rice, Joe Cronin, Stan Coveleski, George Sisler, Heinie Manush, Rick Ferrell, Al Simmons and Early Wynn. Just imagine the stories he would be able to tell. 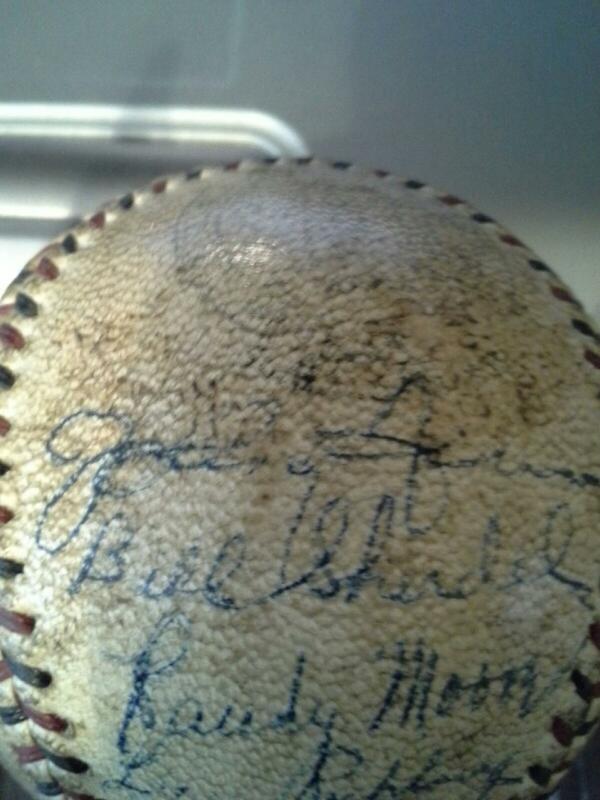 Next in line on my 1930s signed baseball, underneath Sam West, is Joe Kuhel. Kuhel (b. 1906 - d. 1984) played in the majors from 1930 to 1947 for the Senators (1930 to 1937 and 1944 to 1946) and White Sox (1938 to 1943, 1946 and 1947). In his career, he had 2,212 hits, 131 home runs and a .277 batting average. He batted .300 or better in three seasons, batting as high as .322 for the AL pennant winning Senators of 1933. He finished as high as 6th in the AL MVP voting (1936). 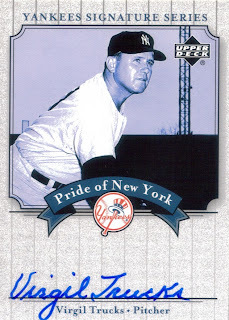 Kuhel appeared on only one Hall of Fame ballot, 1956, where he received 0.5% of the vote. Kuhel only appeared in 18 games for the 1930 Senators, so it is looking like that information may push the time the ball was signed toward the 1931 season. He was on the Senators with Cronin and Sam West from 1930 to 1932. That definitely narrows the time frame down. I always have folks remark to me about how passionate I am about baseball, I must have played it. Well, I played two years as a kid and I can admit that I was terrible. It has always been tough, loving the game so much, but not having a chance to play. So, I took to writing about it, which I definitely enjoy. I never wanted my son, Chris, to feel like I was forcing him to play ball because it was something I loved. I wanted him to play because it was something he wanted to do. So, 4 years ago, when he asked if he could play t-ball, I signed him up, but told him that if it got to where he didn't want to play anymore, I wouldn't force him. Just as long as he finished out his commitment to the season. Well, 4 years later, Chris is still playing. The kid loves baseball. He loves to play it and has already surpassed everything I did on the field. In the two years I played, we had really good teams, but we lost in the championship game both seasons. Today, Chris' team, The RockHounds, won the championship tournament. They had already won the regular season outright (and the preseason tourney as well), but this afternoon they took home the gold, so to speak. Chris was so happy that he and his teammates were able to celebrate a win after a long season and two grueling games today. Yes, Chris is signing a baseball. I thought this was an awesome shot. The coaches he had this year were amazing. Chris made so much progress from the beginning of the season until today. He also made friends with the 12 other guys on his team. They all rooted for each other. There were no egos, just kids enjoying the game and having FUN. I am so proud of all of them. This season was the most fun I have had in all the years we have done this. I hope he can be on the same team with some of the guys next year, but of course, I know a good many of them are moving up to the next level. I learned just recently, that Chris was one of the youngest kids on the team. I mean, I should have known it, but I guess it never occurred to me. Anyway, I know I'm rambling. I'm just so proud of the team, and especially, my son. His trophy is sitting atop my china cabinet for now, but I want to get him something special made with his trophy, uniform, etc, but I have to save for it. Congratulations, Winterville RockHounds, the best team did win today and I am proud of all of you! The next signature on the baseball was one of the easiest to identify, Sam West. West (b. 1904 - d. 1985) played in the majors from 1927 to 1942 for the Senators (1927 to 1932, 1938 to 1941), Browns (1932 to 1938) and White Sox (1942). In his career, he had 1,838 hits, 75 home runs and a .299 lifetime batting average. He was a 4-time All Star (1933, 34, 35 and 37) and finished as high as 9th in the AL MVP voting (1931). That season, he 175 hits, 3 home runs and a .333 batting average. In his career, he batted .300 or better in 8 of the 12 full seasons he played (he played parts of 4 other seasons, but didn't appear in more than 57 games in each of them). His selection to the 1933 All Star team is notable because that was the first All Star team ever assembled, coincidentally, his former teammate, Joe Cronin was also named to that inaugural All Star Team. West appeared on one Hall of Fame ballot, 1948, when he received 0.8% of the vote. He does have a Hall of Fame connection, though, in that in December 1932, he was traded from the Senators to the St. Louis Browns along with Lloyd Brown and Carl Reynolds for Hall of Famer Goose Goslin, Fred Schulte and Lefty Stewart. By being traded, West missed playing on the 1933 AL Pennant winning Senators. Of course, another Hall of Fame connection to these Senators teams is that legendary pitcher Walter Johnson managed the Senators from 1929 to 1932 (If only whomever got this ball signed could have gotten the manager on it...). West isn't connected to the Boston Braves folks that I have shown so far, of course, but he played on the same Senators teams as Joe Cronin from 1928 to 1932, again placing this baseball possibly somewhere around the 1930-31 seasons. The next name on my 1930s baseball that I wanted to talk about is on the side panel, above Randy Moore and Lance Richbourg, former pitcher Bill Sherdel. Sherdel (b. 1896 - d. 1968) played in the majors from 1918 to 1932 for the Cardinals (1918 to 1930 and 1932) and Boston Braves (1930 to 1932). He was 165-146 with 839 strikeouts and a 3.72 career ERA. He went 21-10 in 1928 with a 2.86 ERA (and 5 saves...???) for the Cardinals. Sherdel played in two World Series, beating the Yankees in 1926 with the Cardinals and then losing to the Yankees again with the Cardinals in 1928. He is the first World Series winner that I have discovered on this ball. He appeared on 9 Hall of Fame ballots but never got more than 0.8% of the vote. He does have a Hall of Fame connection, though. He was traded, along with Fred Frankhouse to the Boston Bracves from the Cardinals for Hall of Famer Burleigh Grimes. Sherdel ties into Lance Richbourg and Randy Moore in that he was on the same Braves team that they were on for part of 1930 and then the full 1931 season. It is looking more and more that this ball could have been signed in 1931.